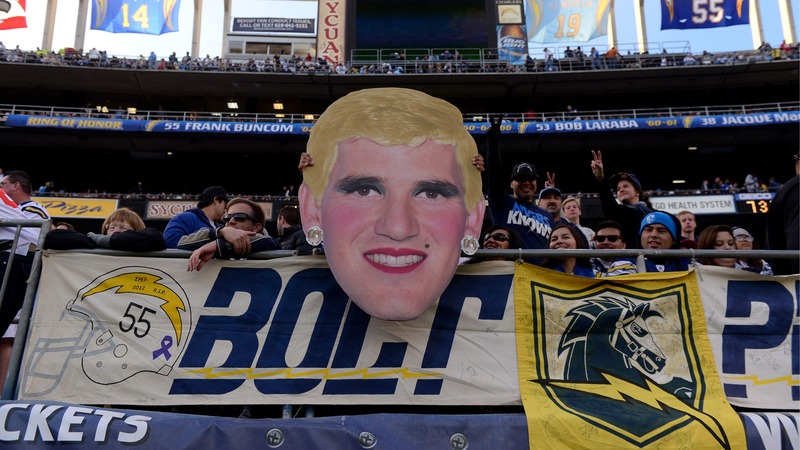 Before we even try to cover everything that happened in the NFL on Sunday, we just wanted to show you the work of Chargers fans yesterday, who welcomed Giants quarterback Eli Manning to town. You’ll remember that Manning refused to play for San Diego coming out of college. Even the best remote control users were put to the test on Sunday with snow wreaking major havoc on several games, as you can see by these great pictures. Just as the Lions-Eagles game exploded in the fourth quarter (Philly outscored Detroit 28-6), the Vikings-Ravens game was just heating up, with Baltimore outscoring Minnesota, 22-20 in the final quarter. FIVE of those touchdowns came in the last 2:05. While this was going on, Miami came back in the final three minutes to beat Pittsburgh, who almost pulled off a lateral miracle. Shortly thereafter, the Patriots scored two touchdowns in the final minute to erase a 26-14 deficit against Cleveland. * Broncos kicker Matt Prater set an NFL record by kicking a 64-yard field goal. * Cardinals defensive lineman Darnell Dockett stomped on Chris Williams’ hand. * Panthers defensive end Greg Hardy is a "Kraken" who went to Hogwarts. * Matt Stafford’s "fumble face" is a must see. * The Vikings were almost taken out by a snow plow. Rays pitcher David Price shared this tidbit while people were eating their breakfast this morning. When your toenails won't allow you to put on dress socks…you know that your toenails are to long!! Auburn coach Gus Malzahn gave one of his classic fist pumps during Saturday’s game against Missouri, and just like that, a graphic came right out of his hand. Taylor University held its annual "Silent Night" on Friday. In case you aren’t familiar with the tradition, fans stay completely silent until the team scores their 10th point. Then, this happens. If you like awkward, tension-filled moments, you’ll love this video of Jay Mohr telling jokes about Danica Patrick at the NASCAR Sprint Cup Awards Banquet while she looks on completely unamused. Thanks to Jason Fraser of Hartford, for sending this over. Model Aneta Kowal gets today’s Fox-y Lady honors.